Tommy Bowe says he has played his last game for Ospreys after revealing that surgery will rule him out for the remainder of the season. Bowe, who will re-join Ulster at the end of the season, will undergo surgery on a haematoma in Ireland on Friday. 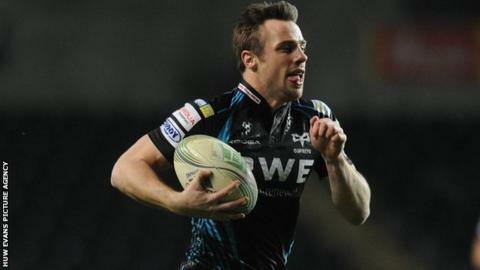 "Obviously, this news unfortunately means that I won't get to wear the Ospreys shirt again," said Bowe. The 28-year-old has suffered with high blood pressure since the start of the year as a result of the problem. A localized swelling that is filled with blood caused by a break in the wall of a blood vessel. The breakage may be spontaneous, as in the case of an aneurysm, or caused by trauma. The blood is usually clotted or partially clotted, and it exists within an organ or in a soft tissue space, such as muscle. Tests have shown the haematoma is pushing into Bowe's left kidney, and after meeting with specialists the Irish winger took the decision to surgically remove the problem. Bowe will return to Wales to recover from surgery but Ospreys confirmed he will play no further part this season ahead of his move to Ulster. "Having confirmed my move to Ulster during the Six Nations I was really looking forward to returning to the Liberty Stadium for the end of season run-in, to help the Ospreys towards hopefully another league title, and also, to say a big thank you to the region's incredible fans for all the support they've given me over the last four years," he said. After moving to the Liberty Stadium in 2008, Bowe has clocked up 180 points in his 77 outings. Recovery time following the surgery is unclear, but the British and Irish Lion could be sidelined for up to four months. "It's important that I get this problem sorted as soon as possible," added Bowe. "Hopefully, the Ospreys will have a home [Pro12 League] semi-final and final in May so that I can still get down to the Liberty to say farewell to the supporters."